WE ARE CURRENTLY VERY HAPPY WITH YOUR SERVICES. HAVE NOT HAD ANY ISSUES. Five Stars. McCloud makes managing our Pest Control System unbelievably easy. They really handle everything so it is one less item on my plate. I highly recommend them for anyone in the market for Pest Management Solutions. Our partnership with McCloud has led to great improvements within our facility. The resources and programs they offer are unmatched within the industry! Happy with our service tech James Rich. I appreciate the extra efforts McCloud is putting forth to assist us in our pest control. Dave Ervin is a joy to work with and very professional. Thank you for your support. Our technician goes beyond. We require exceptional paperwork, service and standards. James does an outstanding job keeping us compliant. James is the reason we stay with McCloud. All the staff have been great to work with in our new relationship. Keep up the great work! McCloud Pest Management has came in and fixed the problems left by the pervious company that was here. Nathan & Jon have always provided us with excellent service. We are preparing for our annual food safety audit, and they are both going the extra mile to ensure our facility is prepared. Outstanding overall service level!! Technitian is always extremly helpful and promt. He is efficient and we only use McCloud b/c we know the job will be done perfectly. It took a little time to initiate the service, but all details were worked out and our warehouse was set up. The technician (Chad Aull) is very professional during his service of our facility, he is a pleasure to work with. We can't find where he left me any paperwork to sign. Wasps nests outside. Was told that we'd be sprayed. Hasn't happened. Mens room is full of gnats. We have brown beetles everywhere. None of the spider traps were checked for brown recluse, even though we've had serious problems with them in the past and the traps are loaded with spiders and beetles. I'd like some followup please and not have to wait another month for some answers. 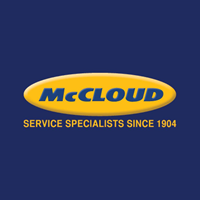 I've used McCloud services for over 10 years. They are miles ahead of their competitors and embrace the concept of "partners in pest control. ".